My husband loves this wine so he purchased quite a few bottles at a recent Michael~David dinner that we had attended. Last night, I decided to open a bottle to serve with dinner. I was making a roasted southwestern pork tenderloin, sweet potato fries (w/ chipolte ketchup) and a salad consisting of baby lettuce (fresh from my garden) with strawberries, red bell peppers, red onions and walnuts tossed with a white balsamic-raspberry vinaigrette. This turned out to be a great pairing. It is a bold wine that really stood up to the strong chipolte seasoning while complementing the fruit flavors. I opened the bottle a 1/2 hour before I served it as I have found this wine to be more enjoyable when I do so. The Lust Zinfandel by Michael~David 2007 was a dark purple color with a ruby rim. It has intense aromas of very ripe mixed berries and baking spices-both allspice and ginger with hints of cedar. It has flavors of creme de cassis, milk chocolate and also more of the baking spices. It is very structured with firm tannins and a long creamy, heavy fruit finish. Very interesting Blog Sandra, your writing is wonderful, and you subject matter is very panoramic. I suppose that your wine reviews are quite subjective on purpose ("My husband loves this wine")? Michael David's Lust-Zin, from another one of your posts, get's a general audience's "favorite of the night" kind of endorsement, but others I've checked with are not so enthusiastic; I went ahead and bought a bottle, and just maybe I'll join your husband's fan-club. In the mean time I'll just enjoy what you post. Thanks for the comment and the compliment! 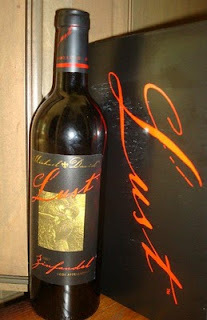 The Lust is a big, bold wine and I really enjoy it with certain foods but it is not a wine that I just sip by itself. I know a lot of people are turned off by the high alcohol. I was at a local food and wine event/extravaganza about a month ago and the Michael David wines were in the line up. There were more than a hundred wines to try and I ended up leaving my notes so I didn't blog on it. I only tried the Earthquake Syrah and the Incognito White that night as those were the only two I hadn't tasted before (I enjoyed both of them). The Michael David table was one of the most popular tables and again the Lust seemed to be a favorite with those with whom I spoke. I will be interested to know how you liked it. you'll see that I referenced yours and "wine access" before I even reviewed the wine; thank for your insight, and I hope you will enjoy the photographs. PS, considering how much I loved the Cakebread Zin, I'm not surprised by the results. I checked you out, very nice pictures! It is hard to decide how best to present each wine photographically. I can see that you are far more artistic than me!